After our more than wonderful Guatemalan trip, I think we're all ready to go back. The plans are in the works for next Summer. The director would like bumper pads for the toddler beds and twin size sheets for the special needs children. She also said they could use some pack-n-plays for the kids who have seizures. We are going to do our best to accommodate them. We're also planning a fun outing for the kids who are old enough to go. We hope to take the kids to the Guatemala City Zoo next summer. We got a price to rent a bus and driver and the director loved the idea. I'm going to make a couple of bumper pad sets to match the measurements we took of the beds while we were there. I'll be sending those down soon and making sure they fit before we get some volunteer seamstresses moving on this project. We'll be finalizing our plans for next Summer's trip in early Spring. I'll post the details here. If you would like to take part, just let me know. We Are Here and All Is Well! Our flight was uneventful and all of our luggage made it! How wonderful! We made our visit to the shop with the outdoor play equipment shortly after we got to the hotel. Talk about fun! It was such a great time deciding what to buy. We finally decided on a large piece of play equipment (large for our price range and the cost for that one piece was about $1500.00). Everything costs about twice as much here simply because it's shipped from the US so shipping fees are added and then import taxes are added on top of that. We got a little play house ($700.00). Each side of the house is a different theme. One side is a school house, one is a little garage/gas station, one is a market and the back has a soccer goal and basketball goal. We, of course had to get an adjustable basketball goal (Mark wouldn't have let us leave without one). We purchased some little foot powered ride on motorcycles, a pedal tractor, a couple of rocking horses. All of that is supposed to be delivered at 10:00 today (latina time). That means certainly not before 10:00 but any time after 10:00. 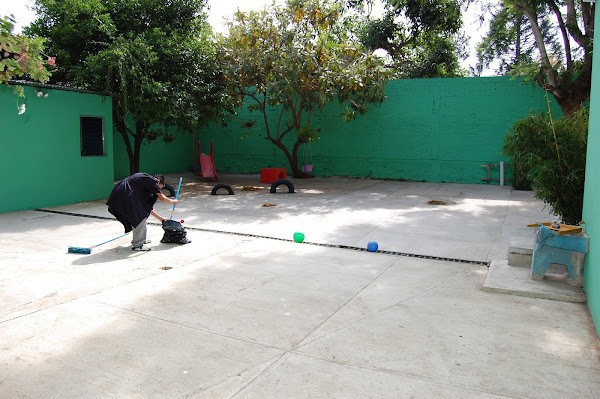 We're going to be at the hogar at 10:00 to receive it whenever it does arrive. Next we headed to a Wal Mart type store to pick up some baby things. We got an ExerSaucer, a floor musical Gym, a bouncy seat, six large cans of formula and thirty baby dolls. Those items cost a whopping $400.00. Our money certainly didn't go as far as I had hoped but we have such a nice amount of things to give. We'll be loading up the van with our "Wal Mart" purchases along with our 7 large suitcases crammed absolutely full of stuff and heading off in a few hours. I promise we'll take pictures and I'll post later. So far today we have five large suitcases full of donated items for Casa Alegria. We still have quite a few more clothes that are not packed yet but we might just save them for my trip in August. We didn't have any luck getting our court date moved up so I'm planning on going down to be there for our hearing on August 10th. I can take a few extra suitcases full of clothes then. We also have some gift cards that were donated so I will have to do some shopping before we go. That means the list will increase! And that's not all.................look at our thermometer! Can you believe it!!! I am absolutely over joyed! Thank you all so much! I can't wait to see the faces of the orphanage staff and the children when we come in with our haul. Hopefully the director will break the rules and let us take some pictures of the kids receiving all of their things. I'm not counting on that but if she does, I'll post them here for all of you to see. (the government has very strict rules against taking photos of the children in the government run hogars) We'll just have to wait and see. I"ll try and post one more time with any new donations before we leave on Thursday night. Please pray for safe travel for the five of us. We really need our plans to go smoothly from the moment we arrive in Guatemala. I am "praying and expecting" they will! Today was our "Hope For Casa Alegria" dinner at church. We had a fantastic turn out! The donations far exceeded my expectations.............and I mean FAR EXCEEDED!! So many wonderful people donated their time preparing food and getting the ministry center ready. It was a tremendous success!!! Here are a few of the volunteers and supporters. Tomorrow is our dinner at church to raise money for the hogar. We're having Beef and Chicken tacos, baked corn,refried beans and of course yummy home made desserts. The chicken is cooking on the stove as I write and tonight we will be going to the church to set up tables, cook some more and decorate. The generous support for the cause so far has been overwhelming! Look at our thermometer!! I had to create a new one with a new top number!! Thank you all who are supporting this effort through donations and prayers. As of now, there will be three others from church who will be coming along with me to deliver items to the hogar. It's going to be absolutely wonderful to see the faces of the children and the staff when we bring everything in. If you live in the area, come join us tomorrow for lunch at 12:00 noon at the Shelburn First Baptist Church. I'll post again with an update after our dinner.